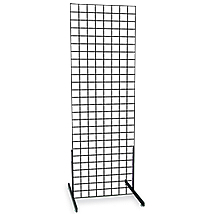 Customize this Grid Merchandiser Display with any 3 in. grid accessories. The 3 in Grid Impulse Display consists of 1- 1 ft x 5 ft panel and a pair of t-legs. This Grid display can accommodate all 3 in. grid shelves, hooks and accessories. Available in Black or White. The 3 in. Grid Display is 12 in w x 24 in d x 60 in h.